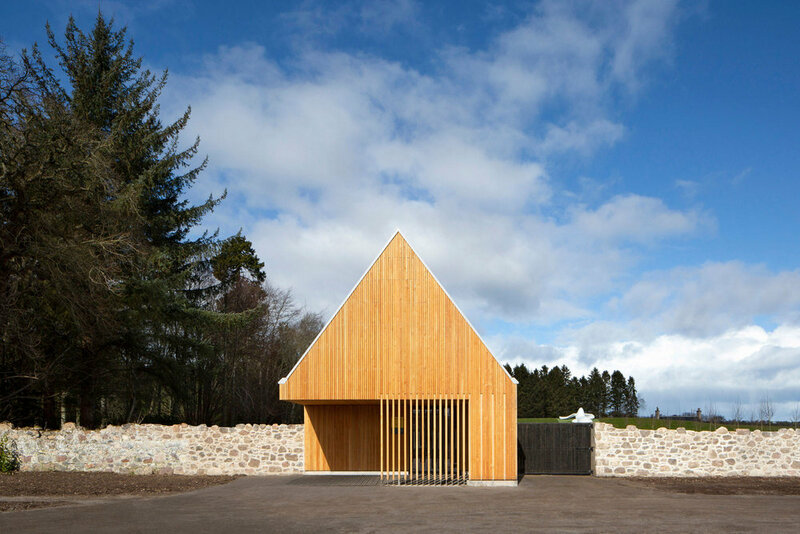 In 2016 Hoskins Architects won a competitive bid to design a visitor pavilion to sit alongside a new landscaped space for exploration and adventure, on behalf of the National Trust for Scotland. Set within the walled garden at Brodie Castle in Morayshire, the site is intended to become a key visitor attraction, further supporting Scotland’s heritage. The garden, now complete, has been designed by landscape architects erz and is based on the themes of family and play. It includes slides, tunnels, and an array of engaging, fantastical sculptural elements. The new visitor pavilion acts as the public entrance to the ‘Playful Garden’ and also provides retail, catering, and indoor play spaces. The pavilion design seeks to evoke the form and materiality of an ancillary agricultural building, in order not to disrupt the hierarchy of built form across the castle estate; while simultaneously feeling like a public building. The design is intended for year-round use, and to support special events and exhibitions. A celebratory opening event was held in the garden in summer 2018.